A lone tree begs to be underplanted. You can be a lot more creative than simply surrounding it with Ivy, Pachysandra or Vinca. Here, Caladiums are the scene-stealers. (Actually, we prefer their common name, “Rainbow Plants,” because no two leaves are ever identical. 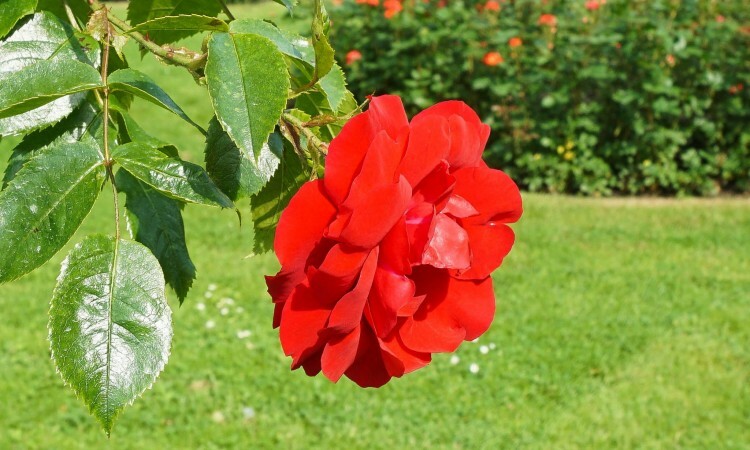 They add lively color to shaded areas.) Astilbes heighten the red and pink color emphasis. 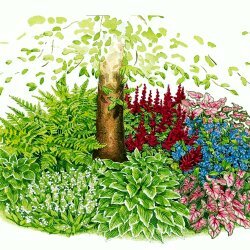 Hostas and Ferns provide long-lasting foliage contrasts.This garden is a delight in any shady location, with or without a tree. Fills approximately 100 sq. ft. with color and elegance all summer long. A Anchusa Azurea (3), Invaluable in summer gardens for their rich and intense blue flowers. Early summer flowering lasts for weeks. .
B Mixed Caladiums (6), Provides a continuous display of beautifully patterned, heart-shaped foliage from summer to frost..
C Lady Fern (3), Great for shady, moist areas where other plantings fail. Lacy fronds are excellent in floral arrangements, a perfect contrast to colorful blooms..
D White Edged Hosta (3), Dramatic broad emerald leaves with a splash of white at the edges. Lavender flowers..
E Lily-of-the-Valley (6), Clusters of fragrant, delicate white bells on 8-10″ stems appear in mid to late spring amid emerald green leaves..
F Red Fanal Astilbe (3), Mound-shaped perennials with fernlike foliage produce dozens of soft feathery scarlet red flowers on 20-40″ tall spikes in late spring to early summer..